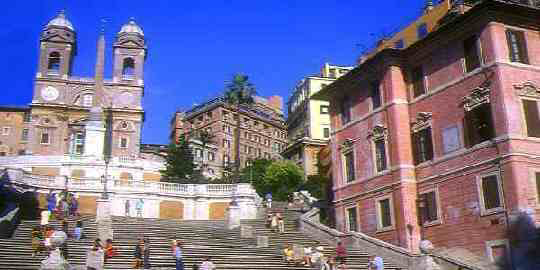 The Scalinata di Spagna, or Spanish Steps, are located in an upmarket area of Rome, and join the Piazza di Spagna with the church of Trinita dei Monti with its twin towers that dominate the skyline. The church was built in 1502 by Louis XII, next to St. Francis di Paola's monastery. The Spanish Steps are usually very crowded during the summer months, with tourists just sitting, chatting, and taking a rest from visiting the designer shops that litter the area. It may seem like a good place to eat a picnic lunch, but the Italian authorities, in an attempt to keep the area clean, have banned visitors from eating whilst sitting on the steps. The staircase has been constructed using 138 steps. Designed in 1723 by Francesco De Sanctis, and funded by a French diplomat Stefano Gueffierwas, the steps are a mix of curves, straight flights, vistas, and terraces. The steps have needed to be restored many times over the years, with the latest restoration being in 1995. 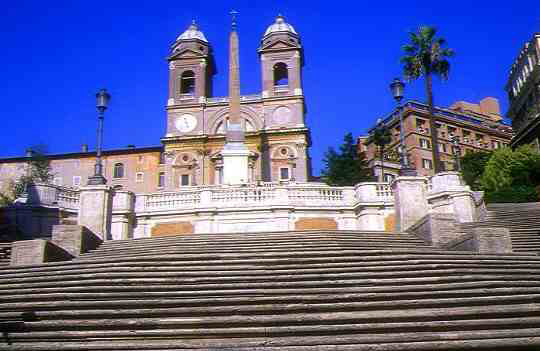 The Spanish Steps got their name from the Spanish Embassy to the Holy See which was located in the piazza. During the 18th century, the Spanish Steps became a meeting place for both artists and models. These days, located to the right at the base of the steps, is a house where the English poet John Keats lived and died. The house is now a museum dedicated to his memory.